Tablets have become quite popular thanks to their extreme portability, easy to use interfaces and the wide range of functions they can be used for. In many ways, the best tablets can almost replace a laptop for someone on the go. But is a tablet really a better choice for someone over a more traditional laptop? After all, laptops can also be extremely portable and have a much wider range of tasks they can be used for. 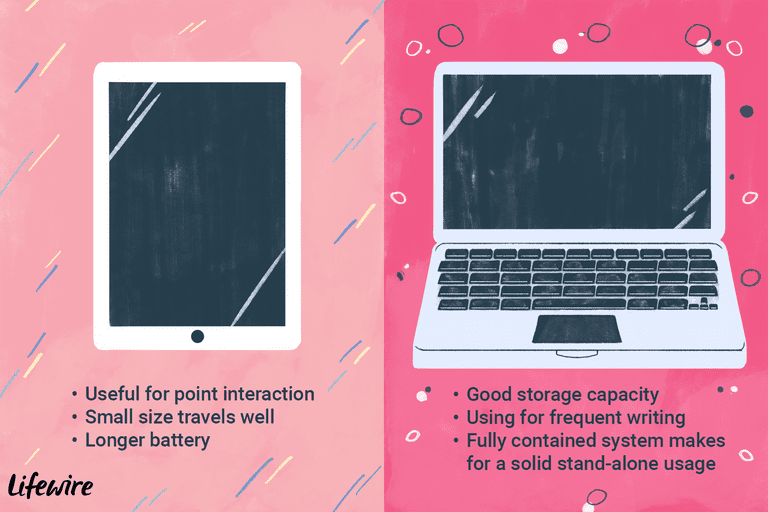 This article will compare the various differences between tablets and laptops to see how they compare to one another and which of the two may be better. By examining these in more detail, one can then have a clearer understanding of which of these two types of mobile computing platforms would serve them better. The most obvious difference between a tablet and a laptop is the lack of a keyboard. Tablets rely solely on a touchscreen interface for all input. This is fine when it involves mainly pointing, dragging or tapping to navigate around a program. The problems come in when you have to input text into a program such as an email or document. Since they have no keyboard, users are required to type on virtual keyboards that have varying layouts and designs. Most people cannot type as quickly or as accurately on a virtual keyboard. 2-in-1 designs that provide a detachable keyboard for a tablet may improve the ability to type text but they still generally fall short of a laptop experience because of their smaller size and more restrictive designs. Users with regular tablets can also add an external Bluetooth keyboard to make this more like a laptop but it adds costs and peripherals that must be taken with the tablet. This is probably the biggest reason to go with a tablet compared to a laptop. Tablets have the size roughly of a small pad of paper and a weight that is under two pounds. Most laptops are far larger and heavier. Even one of the smallest ultraportables, the Apple MacBook Air 11 weighs just over two pounds and has a profile that is larger than many tablets. The main reason for this is the keyboard and trackpad which require it to be larger. Add in more powerful components that require additional cooling and power and they get even larger. Because of this, it is much easier to carry around a tablet than a laptop especially if you happen to be traveling. Tablets are designed for efficiency because of the low power requirements of their hardware components. In fact, the majority of the interior of a tablet is taken up by the battery. In comparison, laptops use more powerful hardware. The battery component of the laptop is a far smaller percentage of the laptops internal components. Thus, even with the higher capacity battery of laptops, they do not run as long as a tablet. Many of the tablets right now can run up to ten hours of web usage before requiring a charge. The average laptop would only run for roughly four to five hours but many newer laptop designs are getting closer to eight making them close to tablets. This means that tablets can achieve all day usage which few laptops can achieve. In order to keep their size and costs down, tablets have had to rely on new solid-state storage memory as a means to store programs and data. While these have the potential for faster access and low power usage, they have one major disadvantage in the number of files they can store. Most tablets come with configurations that allow between 16 and 128 gigabytes of storage. By comparison, most laptops still use traditional hard drives that hold far much more. The average budget laptop comes with a 500GB hard drive. This won't always be the case though as some laptops have moved to solid-state drives as well and may have as little as 64GB of space. In addition to this, laptops have things like USB ports making it easy to add external storage while some tablets may allow extra space through microSD card slots. Since most tablets are based on extremely low powered processors, they will generally fall behind a laptop when it comes to computing tasks. Of course, a lot of this will depend on how the tablet or laptop is being used. For tasks like email, web browsing, playing video or audio, both platforms will typically work just as well as none requires much performance. Things get more complicated once you start doing more demanding tasks. For the most part, multitasking or graphics performance it typically better suited with a laptop but not always. Take for instance video editing. One would assume that a laptop would be better, but some high-end tablets can actually outperform laptops because of their specialized hardware. Just be warned that tablets such as the iPad Pro can be as expensive as a good laptop. The difference is the laptop version has more capabilities, which brings us to the next item to consider. The software that runs on a laptop or tablet can be vastly different in terms of capabilities. Now if the tablet PC is running Windows it can theoretically run the same software as a laptop but will likely be slower. There are some exceptions to this such as the Microsoft Surface Pro. This can make it easy to use it as a primary laptop using the same software used in a work environment. The two other major tablet platforms right now are Android and iOS. Both of these require applications specific to their operating systems. There are many applications available for each of these and many will do most of the basic tasks that a laptop can do. The problem is the lack of the input devices and hardware performance limitations mean that some more advanced features supplied by corresponding laptop class programs may have to be dropped in order to fit into the tablet environment. There are really three tiers of tablets on the market. The majority of the tablets are budget models that cost under $100 which are good for simple tasks. The middle tier runs from around $200 to $400 and do most tasks just fine. Each of these is much more affordable than most budget laptops which really start around $400. Then you get the primary tablets that start around $500 and go to over $1000. These may provide the performance but at the prices, they tend to start falling behind what the laptops can achieve at the same price point. So it really depends upon the type of tablet and computer that you are going to be comparing. On the low end, the advantage is clearly for tablets but at the higher end, laptops because much more competitive when it comes to cost. This category is describing a situation where a tablet would be your only computer system. It isn't something that many people would necessarily think about when looking at the devices but it is pretty critical. A laptop is a fully self-contained system that one can usefully in terms of loading data and programs onto and backing up. Tablets actually require an additional computer system or connectivity to the cloud storage for backing up the device or even activating it. This gives the laptop an advantage as tablets are still treated like secondary devices even when it comes to their apps and data.